Well, are you ready kids? I can't hear you!! Ohhh, who lives in a pineapple under the sea? Spongebob Squarepants! Absorbent and yellow and porous is he!...Ok, sorry, I woke up with that in my head. Pray for me. Anyway, who's happy it's Saturday? Me, me, me!! We have a big day planned here in Liles Land. The girls just left with Eric to go get a birthday present for a little boy that I used to watch after school. I don't "do" boys, so I am clueless as to what to get them. That's why it's always his mission to take care of that situation! Then comes his little skating party later this morning. No, I won't be skating. Then this afternoon, we are taking the girls out to get school supplies and school clothes. When Lindsie heard about these plans last night, she couldn't wait to go to bed as she said this was going to be "the best day everrrrrrrr!" (from both of our favorite Spongebob episode). Speaking of the best day everrrrr!! !, don't ya'll just love Saturdays for the simple fact that it's time for Jen's Sketch For You To Try ! Almost all day yesterday, I thought it was Thursday, and finally realized last night about 8 PM (after watching 2 episodes of Spongebob in a row) that I needed to make my SFYTT card! Eek! 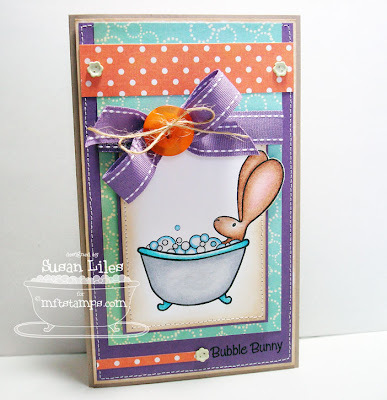 Luckily, I already had this image from My Favorite Things called Bubble Bunny Flopsey stamped and colored from when I went to the Scrapper's Boutique and hung out on a Friday night and played with my friends! The bunny and tub are colored with Prisma pencils and blended with Odorless Mineral Spirits. The bubbles are highlighted with a blue Copic marker and Ranger Glossy Accents. I like the "simpleness" to this card and the colors are fabulous! I must use it again. They would be darling for Halloween! SUSIE Q-TIP: When using brads, tap them gently on the front with your craft hammer for a finished look. Here's the trick: Turn it over and tap the back, too. This will make them nice and flat so that when you go to glue that layer down, you won't have any corners (where brads are often put) trying to stick up because of the "legs" not being completely flat. So cute, Sus! And you know I know the Spongebob theme song backwards and forwards! We've watched from the very first episode, back when Truman (who's now almost 13! Eek!) used to call him 'Fungebob' because he had a hard time with the 'sp' sound... *sniff*... Now you've made me cry! Dang. I'm pathethic! Have fun on your BEST DAY EVERRRRRR! Do a little jellyfishing for the Burrages! Adorable, Susan! I'm lovin' those colors, too! Have a great weekend! Oh, that bunny is just adorable, Sus! AND--I love what you've done with the horizontal layers--perfect balance, girlie! Oh, I feel you - I often have the SPongebob theme in my head. My little one loves Spongebob which is a little crazy though since she is only 3!! Anyway, enough about that. Love your card!! Flopsey is fabulouis and I just love the colour combo!! You are hilarious girl!! LOVE this card and your tip is awesome!! Oooh. What a cute bunny! He looks so relaxed in his bubble bath! The colors you used on this card are just amazing together. Fun image too.